There are few shows in town more charming than Lindsay Posner's re-working of this 1940's all-American fable. Widowed Veta Simmons lodges with her daughter in the home of her wealthy brother Elwood P Dowd. Yet much is amiss, for as Simmons strives to keep up a genteel facade of normality, Dowd's closest confidante is Harvey, an invisible giant rabbit and much of the play hinges upon the anguish that his behaviour causes to his loved ones. This parable of the savant, who in today's jargon would be classified as somewhere on the autistic spectrum and yet who sees his world with a clarity denied his fellows, has already been explored in Rain Man and Forrest Gump. Yet Chase’s Pulitzer Prize-winner preceded those modern classics by some decades and as her Harvey lifts the curtain on a petty-minded small town, so we see Dowd's noble and chivalrous pursuit of all that is good in life, shine out as a beacon amongst his morally flawed peers, all signed up to the rat-race. 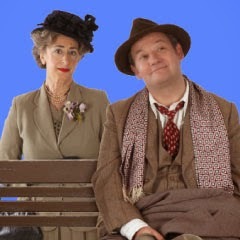 James Dreyfus is Dowd bringing a comic pathos to a beautifully created character. We laugh at the witty excellence of his performance though with a compassionate chuckle rather than the poking of cruel fun at a Bedlam lunatic. Dreyfus convinces us of his belief in Harvey and at the same time plays the straightest of bats as his (and the company's) pinpoint timing sees the plot's farcical elements unfold delightfully. Opposite Dreyfus is Maureen Lipman's Veta. Amongst the best actors of her generation, Lipman commands our sympathy as she strives to find a suitor for Myrtle Mae her grown daughter, whilst supporting her brother's mental frailty. We feel her frustration at the difficulties she has to manage, yet at the finale we almost weep at the loving compassion she shows her sibling. Powerful stuff indeed, although glossing over the physical abuse Veta inadvertently suffers in the local sanitarium, as comedy rather than the ghastly brutality that it truly represents, is perhaps the script's only flaw. It was to be another thirty years before Jack Nicholson's Randle P. McMurphy in One Flew Over The Cuckoo's Nest was to define how the cruelty of mental institutions should truly be portrayed. Peter McKintosh's set displays an ingenious elegance as interlocking revolves shift the action between home and clinic, whilst meticulous design in both costume and wigs set the time and tone perfectly. Old fashioned for sure and with American accents that occasionally grate, the show is a curiosity of a production, but nonetheless bravo to the Birmingham Rep and its co-producers for having taken it on the road. When late into the second act, as Dowd reveals that during his lifetime he has known what it is to be “smart” as well as what it is to be profoundly pleasant, it is with a moving wisdom that he reports (and we feel chastened), that "being pleasant" is nicer. An allegory with the feel-good warmth of an adult fairy tale, Harvey makes for excellent theatre performed by a fabulous cast.